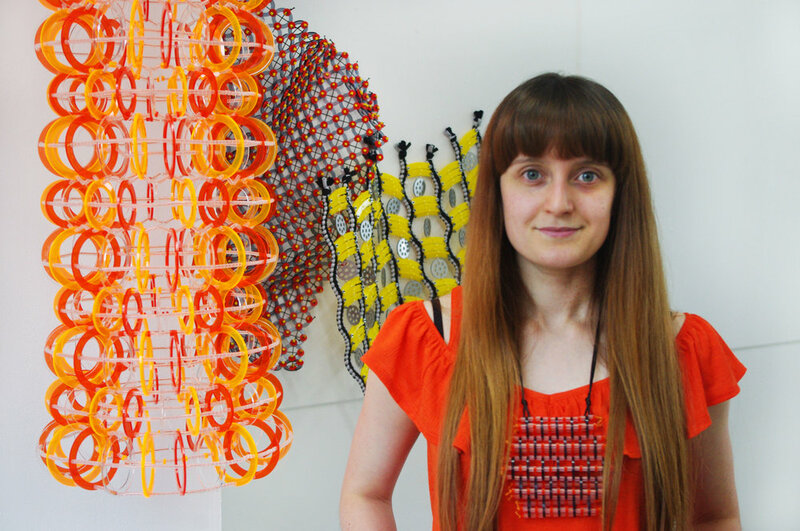 A graduate from Bath Spa University in Textiles for Fashion and Interiors, Odette combines a variety of disciplines including Jewellery and Lighting Design into her practice. Specialising in constructed materials, Odette combines traditional and contemporary techniques from drawing and collage to knitting, macramé and laser cutting. Recently exhibiting her work at the prestigious 44AD Gallery Space, Bath, England. What best describes what you do, as technically as possible? I would describe myself as a designer maker. I use a combination of traditional and contemporary techniques such as drawing/collage, knitting, macramé, crochet and laser cutting to create innovative and engaging textile pieces for fashion and interior environments. I am greatly inspired by a passion for making and craftsmanship. How long have you been working on your craft? I have had a compulsion to make and create since being a child. I was taught to knit at 8 years old and it’s a skill which has been present in my practice both professionally and recreationally since. In terms of my most recent work, I started utilising laser cut technology in my 3rd year at university. It was a great opportunity to compliment my hand craft with digital components and I want to keep pushing myself to continue experimenting. If you could give a lecture to a top university class, what would it be on? I would love to give a lecture back at my university about my craft. As mentioned, I consider myself a designer maker, this is because I often do design through making. I’d like to encourage others that it is okay to design this way as we are often expected to draw and plan ideas before making them. I’ve always found this to be limiting as I can’t always conceptualise an idea to its full potential without trying to physically make it. When you conceptualise your jewellery, who’s wearing it? I’d like to think that my jewellery has a wide appeal for all ages. Due to the materials each piece is incredibly lightweight and suitable for everyday wear, because of the wearabilty it's easy to have a fun eye-catching addition to an outfit with minimal effort. At my most recent show I had some great feedback on the style and colour combinations which was fantastic to hear. Your jewellery work is a synecdoche for your larger pieces, which one came first and how come? The larger pieces came first and were a product of my degree show and subsequent design shows. I wanted to scale down the techniques into jewellery to show the versatility of my skills and techniques while making more affordable and marketable items. Where are people going to find your work in ten years time? Hopefully in their homes and jewellery boxes! I’d love to expand an interiors range after creating the lightshades last year. My website odettesmaldon.com will soon have a shop available to purchase the current jewellery range. Are you accepting commissions now, and who is the dream client? Absolutely! I would love the opportunity to create more large-scale pieces for specific places. A collaboration with Tom Dixon or Giles Miller would be a dream. I love their use of materials and the overall aesthetic. What do you think splits design from fashion? For the majority of my design education I always assumed I would design for fashion but in recent years this has migrated into more interest in interiors. I think the opportunity to translate design into a large array of products appeals to me presently. Fashion design can be fleeting in its lifespan but I strive for what I create to have a more lasting appeal. Where were you in life when you started connecting the shapes? I think I've always endeavoured to connect shapes in one form or another. I do consider myself to be a problem solver and when it comes to design it’s a very valuable skill. For example, I initially had no idea how I was going assemble the lightshades until I had the components in my hands and started piece it all together. What’s the strangest response you got from your most recent show? I actually had some really kind and inspiring feedback from the show. It has encouraged me to get out there again and attend design fairs this year. I think it is really important to be present at these types of shows so potential clients can really engage with the designer. The work is super marketable, how much of it is intentionally so? I have certainly become more aware of the marketability of my work since graduating, hence the transition to jewellery and lighting design. It is much easier for people outside of the design world to understand what I do compared to showing textile samples, where I would often get asked ‘but what is it?’. Being able to highlight the potential of my techniques has proven to be very beneficial in discussing my work. What is it about plastic that makes it the weapon of choice in your work? The versatile qualities of acrylic/Perspex excite me when designing, the array of colours and finishes keeps me inspired. I particularly enjoy working with the transparent colours, especially with the lighting pieces as they refract the light really beautifully. I would also like to advocate for plastic being considered a precious material. We are all aware of the issues surrounding single use plastic and its physical longevity. I aim to make long lasting and loved pieces that want to be coveted. Additionally, I try to minimise waste by using the most of each acrylic sheet I laser cut. Kevin McCloud calls you tonight. Where in the house is your work? Well I am usually wearing something! Each room of my home tends to feature something I have made. Currently one of the orange lightshades is in the hallway and makes me happy every time I see it.